Comfort 2 Go Portable Swing - Fanciful Forest is rated 4.9 out of 5 by 13. Life isn’t lived in one place. When you have places to go, the Comfort 2 Go Portable Swing is easy to take with you. The compact frame is easy to transport, with all the same features you’d expect from a full-sized swing. Your baby can rest easy while enjoying automatic swinging motions, listening to soothing melodies, and reaching for the plush hanging toys. Specially designed by Ingenuity to make parenting easier, you don’t have to sacrifice function with this mini swing. The 5-point harness and non-slip feet ensure your baby’s safety, and comfort is in full swing with the ultra soft seat pad. The swing grows with your baby thanks to weight-sensing technology, and the extra head support can be removed when baby outgrows it. Your baby’s happy place can be at home or on-the-go with this swing. Dimension (in) 28.5" x 22.5" x 23"
Seat pad – Remove from frame. Fasten buckles on seat restraint and seat pad. Fasten all hook-and-loop patches to the corresponding patch. Machine wash with cold water, gentle cycle. No bleach. Tumble dry, low heat.Headrest – Fasten all hook-and-loop patches. Machine wash with cold water, gentle cycle. No bleach. Air dry flat.Toy bar and toy – Wipe clean with a damp cloth and mild soap. Air dry. Do not immerse in water.Frame – Wipe the metal frame with soft, clean cloth and mild soap.Storage – When putting swing away for storage, always store in a dry location, away from any heat sources, and out of the sun. 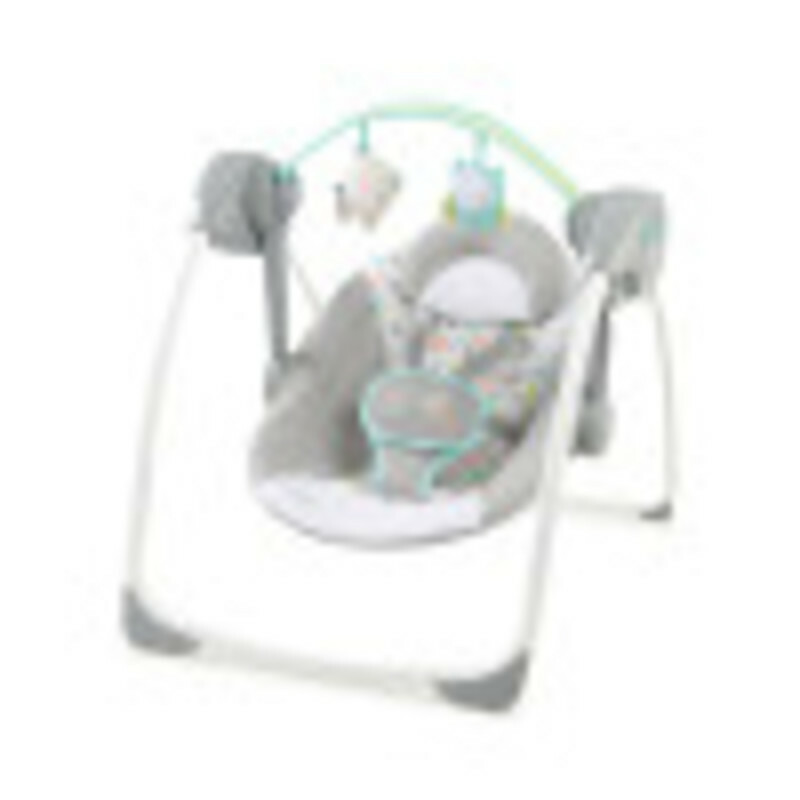 Rated 5 out of 5 by Sarra Baptist from Great for on the go This swing is so convent to have . I’m on the go a lot and I love I can pack this swing up and take it with me. My baby can swing while we are at soccer games and other things we like to do. The style and colors are so cute. This swing is so easy to put together and to fold up and take along with us . It’s made very well. I also enjoy being able to have the swing right next to me at home in any room I’m in . Very cute product made very well and easy to use . Rated 5 out of 5 by Sarra Baptist from Great for on the go This swing is so convent to have . I'm on the go a lot and I love I can pack this swing up and take it with me. My baby can swing while we are at soccer games and other things we like to do. The style and colors are so cute. This swing is so easy to put together and to fold up and take along with us . It's made very well. I also enjoy being able to have the swing right next to me at home in any room I'm in . Very cute product made very well and easy to use . Rated 4 out of 5 by Kelly19 from Basic swing, good for moving around with This is a pretty plain portable swing, and it is easy to move. This only runs on batteries, but does have a decent battery life. The swing is comfortable and the material is soft. The toys are nice that hang overhead. I use this as a back up swing, so it's really not used as much as my other one because we just like the taller one better. Overall, this is a good swing at a great price. Rated 5 out of 5 by Tracey1361 from For "On the Go Parents" When we put the swing together, I was worried that it wouldn't swing smoothly. However, after trying it with the baby in it, it was perfect. Smooth with a nice slow speed. I love that it's so easily transportable. Folds down flat for easy transportation. Great for On the Go parents. If you don't have a lot of room for a huge swing, this is the swing for you! Rated 5 out of 5 by Cobainian from Such a great little swing! We do not have a big house, so it is important that the baby items we have don’t take up much space. This Ingenuity Confort 2 Go Portable Swing is perfect for us because we can easily fold it up when we’re not using it. The other great thing is we can take it anywhere! Taking a trip to Grandma’s? Just pack up the swing so my son has a place to sleep! My son loves to take naps in this swing. It’s perfect for our needs! Rated 5 out of 5 by Cobainian from Such a great little swing! We do not have a big house, so it is important that the baby items we have don't take up much space. This Ingenuity Confort 2 Go Portable Swing is perfect for us because we can easily fold it up when we're not using it. The other great thing is we can take it anywhere! Taking a trip to Grandma's? Just pack up the swing so my son has a place to sleep! My son loves to take naps in this swing. It's perfect for our needs! Rated 5 out of 5 by Happy Customer from Excellent Swing This is the perfect swing! It is so easy to fold and transfer for the on the go moms! Rather it’s from room to room or Grandma’s house. The colors are perfect and my little one loves to watch and reach for the hanging animals. I would highly recommend this swing! !